You Can Care for the Matibo Kinship Kids in Uganda for ALL of 2019! The heart of Kinship is the idea that we all take care of each other. At Matibo Kinship Project, dozens of orphans, along with widowed caregivers, have no one else to take care of them – they need you. This Giving Tuesday, you can make sure the Matibo Kinship Kids are taken care of all year in 2019. They do not have any monthly sponsorship, and they need $19,000 for the year in order to provide their orphans and widows with food, medical care, school supplies and fees, clothes, and a safe place to call “home”. 100% of your gift today, Giving Tuesday, will take care of the orphans and widows of the Matibo Kinship Project who have no one else. Your gift today will care for orphans like Elinah. Elinah's father committed suicide when she was only a baby. Even though she was too young to remember, her father’s death haunted her. When she first came to the Matibo Kinship Project, she was one of the most terrified children we’d ever encountered. Every night, Elinah was plagued with nightmares. In her dreams, she would be chased by a ghost of a man, who she called her father. She would run and run and run, until she woke up. And then, when she woke up, she would start running again – sometimes right out the front door of the Matibo Kinship Project. It got so bad that a caregiver would have to keep watch over Elinah at night, to keep her from running away and getting hurt. 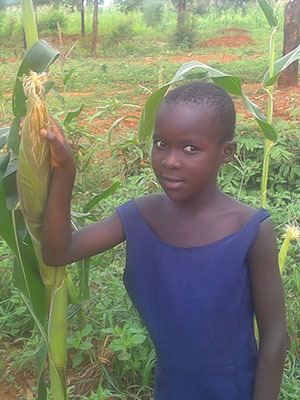 The Matibo Kinship Project needs your help to care for Elinah and so many other children like her. A gift of any amount will be a huge blessing to them. Can you help? Donate today, and 100% of your gift will go towards those children. Your gift today will help Elinah sleep peacefully at night. With your gift, Elinah could go to school and become a nurse someday. Your care and support for Elinah will help her heal from her traumatic past and sing a new song from her heart – that’s the healing power of Kinship! Just $25 can feed a child for an entire month. $50 can buy a child a new mattress. And $160 can pay for a child’s school fees for a whole year! A gift of any amount today will make a difference for a child in need. Monthly Kinship supporters play a fundamental role at Kinship United. By making your Giving Tuesday gift monthly, you will build an incredible connection with your Kinship Family at the Matibo Kinship Project. Your monthly gifts will become the lifeline for the kids’ daily needs, and you’ll get regular photos and updates from your new Kinship family. 100% of your donation gives them necessities like food and clothing. AND you get regular photos and updates from your new Kinship family! I'd Like to Become a Monthly Kinship Sponsor!